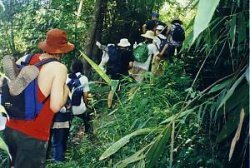 Walk through the mountain wilderness southwest of Chiang Mai, along the foothills of Doi Inthanon (Thailand's highest peak 2565 m). 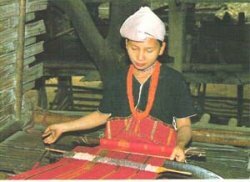 Enjoy the nature and stay overnight in very friendly Karen hill tribe villages. In the morning pick up from the airport or your hotel. Drive about 1 hour in southern direction to the Mae Wang valley and stop at a local market to buy some snacks and drinks. Then enjoy an approx. 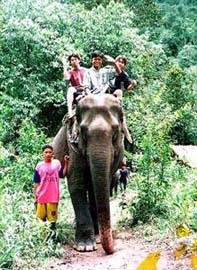 90-minutes elephant ride in the forest. Go on to a waterfall where you can take a cool shower. Then start walking. The nice nature trail will bring you to a Karen hill tribe village for overnight (today's walking approx. 2,5 hours). 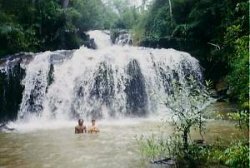 Continue your trek in the hills, passing various Karen and Hmong villages as well as a royal farming project, which has the object to support the poor farmers and hill tribe people. See another waterfall. From here short transfer to a small riverside village for lunch. 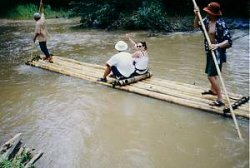 Then start your trip down river on a bamboo raft. Late afternoon transfer back to Chiang Mai, where you will arrive approx. 16.00-17.00. Go on trekking for another 2-3 hours to a small riverside village. After lunch same program as in above itinerary CNX-051 (day 2) with bamboo rafting and then transfer back to Chiang Mai late afternoon. Same itinerary as above CNX-052, but on the second day do an extra loop and trek to another remote Karen hill tribe village for overnight. Trek to the waterfall camp on the third day. On the last day as in the itinerary above with bamboo rafting and transfer back to Chiang Mai in the late afternoon. Not strenuous walk, however participants should be able to walk around 4 to 5 hours a day on hilly trails. We provide a small rucksack, sleeping bag or sheet and a water canteen. During the winter season we recommend to bring long sleeves sweater or a jacket. We also advise to bring mosquito repellent.